TPC Overall Rank: #140 out of 2933 rides. In User Top 10: 61 times. User Tracker Count: 393 times. For years I thought that Buzz Lightyear was by far superior to any other shooting dark ride out there with it’s incredible theming, wide-array of targets, and all-around great ride experience. But commonly those who had been on Men in Black have had nothing but praise for the attraction, just stating that it put all other examples of this type of ride to shame. Is it really that good? Oh yeah, and then some! This attraction just blew me away! Personally I’m not a fan of the attraction’s futuristic exterior. 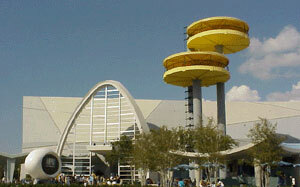 I know it’s supposed to be themed to a World Fair exhibit, but I just find the building an eyesore in my opinion. However, that certainly doesn’t undermine the attraction one bit. Upon entering the World Fair exhibit (queue) extraterrestrial activity is reported. Apparently this attraction has a pre-show, but I never got to experience it since it was down during my visit, presumably due to the almost non-existent lines for this attraction (seriously the longest wait I saw was 5 minutes!). If lines ever did get lengthy, I definitely recommend the utilization of the single-rider’s line. Nonetheless, the queue is very well themed, complete with the comical worm guys who fire insults at future riders and different facilities at the Men in Black headquarters such as the weaponry room and the training facility, where the very efficient dual-boarding station is located. The cars are incredibly roomy and atypical for this style of attraction, I actually prefer the back row to the front, since the back row is elevated significantly higher, leading to greater ease at hitting targets. Also, I have nothing but praise for the guns the attraction utilizes as they were very natural in my hand and I love how they aren’t mounted to the vehicle (cough: Buzz cough) making firing at targets child’s play. I especially love how I didn’t have to keep on pulling the trigger; I could just hold it down all ride and it would shoot with stunning precision. First and foremost, I love the competition element of the attraction. The attraction utilizes two entirely separate courses which each have their own specific targets and features. While it seems like a subtle touch, the competition really got my competitive juices flowing and just made the attraction that much more exciting and enjoyable. Hershey also utilized this on Reese’s Xtreme Cup Challenge and that was really the only redeeming element of that attraction in my opinion. However, Men in Black differs as it provides a mind-blowing experience, even if it lacked the competition element. Just the sheer number of targets Universal has included is unbelievable. Everywhere I looked there was an alien firing at the vehicle. Some were in plain sight, while others were hidden behind dumpsters or were high above in windows. Each ride I discovered new targets, and even after my three rides, I still know that I missed a ton of them. Not only that, but each of the many aliens has their own unique appearance, which is subtle, but it shows Universal’s dedication to excellence. Even better, some aliens retaliate against riders if we fail to neutralize them, causing the vehicle to spin out of control, a very cool feature that definitely adds to the experience since it just feels like I’ve lost control and am at the alien’s mercy. Heck, the Gs provided during the spinning actually triumphs most spinning flats. Midway through the attraction, I came face to face with the other riders, who are revealed as aliens. This results in a frenetic shootout between vehicles to hit the flashing target situated just above the car. Hitting it results in the vehicle spinning out of control, and a major advantage for the other car since they have some time to rack up buckets of points while the other team is discombobulated and unable to fire. Arguably the most impressive scene in the entire attraction is the finale, where riders come face to face with by far the largest alien featured in the attraction. It’s just an engineering marvel and the complexity of it is awe-inspiring. One problem though, the alien is immune to fire! The only solution is utilizing the mysterious red button featured on the vehicles when prompted by the agents. It adds an extra 100,000 points to your score! Immediately following the attraction, the winner is revealed and each team receives a grade for their overall team score. Unfortunately my team never won, but I scored higher and higher each time, eventually scoring a high of something in the high 500,000s. Men in Black is just an all-around incredible experience and a nearly flawless attraction from start to finish, combining a stunning array of complex targets intertwined with the competitive element which just makes this attraction a winner. No other attraction of this style can even come close to Men in Black, and heck, Men in Black is just flat out one of the best attractions I have ever been on. Just the pure fun and enjoyment of this attraction just can be matched by very few attractions. Essentially this is a flawless attraction, and the only negative I can think of it that the ride eventually ends (in reality the ride is actually pretty long, around 5 minutes)! Yeah, it’s just that good! Under any circumstances, ride Men in Black while at Universal and you will be amazed. This is ride is so stupid it is unreal. This and Buzz lighyear are the exact same attraction. Why don&#39.t they get rid of this ride? They got rid of Back to the future and that was alot better. This was a great ride. The shooting and spinning were great as well as the scenery. Great shooting ride. The story is fun and so is the scenery. The only bad thing is all of the spinning. Also the dont tell you how to play. I didnt know there was a bonus button! best rideee!!! i pushed the red button! yay! I loved this ride. The MIB headquarters is great. The shooting and dueling aspects are great fun, especially when you shoot the other car and they spin around. Fantastic re-rideability.